Although Fats Washington's Ride label was nominally based in his LA home town in reality it travelled around the US with him as he toured. He would record local R & B acts in local studios and release them as and when he could. 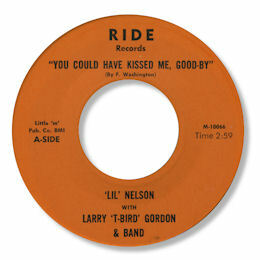 Most of the Texas acts on Ride were backed by the famous Larry T-Bird Gordon and his band - like this one by the obscure Li'l Nelson. I'm a real sucker for this sort of blues based ballad - check out the tasty horn charts and excellent guitar fills behind Nelson as he sings his troubled tale You Could Have Kissed Me Good-by. The bridge is really good but the best part are the last 45 seconds when Nelson jacks up the emotional temperature, really cutting loose. In view of the erratic nature of Ride dating the label's releases is all but impossible but from the sound of this one I'd say mid-60s.